The World’s Greatest Happy Hour | Sprezzatura, Y'all! Today we did nothing. No plans, no commitments, no schedule, nowhere to be – just nothing. These are some of my favorite days here. I know that sounds a little crazy – you fly 5,000 miles across an ocean to do nothing? Shouldn’t I be seeing some magnificent work of art, or going into some ancient church, or seeing an opera performance? Something cultural, historic, or artsy? Well, I say that all that is wonderful and I do absolutely love those things. But for me, some of the best times are when things just happen. Our friends Tim, Julie, and Chip are in Italy and our paths overlapped for a couple of days. We got in on Monday and they came to Anghiari on Wednesday and left this morning. Because all of our Italian friends knew they were coming, we were busy having lunch, dinner, and touring around. So what was supposed a respite in their busy tour through all the riches of Italy turned out to be a little more hectic. And the food – well, let’s just say I really didn’t know that humans could consume that much food without visiting the emergency room. Wednesday they came here around 1:00 – just in time for lunch! We went to the Gran Duca, the restaurant below the apartment we lived in when we were here for six months. It was, as always, a tremendous feast. I had the bringoli (a fat, long pasta) with sausage, zucchini, and truffles. Steve and Tim had the wild boar stew and Chip and Julie had the pappardelle with wild boar. All were fantastic. We heard all about Chip’s adventures (Chip is Julie’s brother and it’s his first trip to Italy) and his impressions of the country. He’s one of us so his impressions were good. It’s always so good to listen to someone who is seeing Italy for the first time. Their experiences and observations are always so interesting to me. We are so used to seeing the world only through our own eyes. We need the perspective of others to make our own opinions more informed. After lunch we strolled through town a little and then Tim took Julie and Chip back to their agriturismo for a rest before dinner. Then Tim came back and had happy hour with us in our apartment. We had a nice catch up with Tim and then we went to fetch Julie and Chip for dinner. We went to Sansepolcro for dinner to one of our favorite places, Da Ventura. It’s famous for its meat trolley. Stay with me here, because this is worth it.. When you order a meat dish there, they bring out a trolley with many more meats that you can add onto your original meat order. It’s a wonderful thing. That night they had porchetta, veal shank, and beef. Of course we had it and it was great. I didn’t have the trolley – I had a sliced veal steak and Steve had the famous Bistecca Fiorentino. A two pound slab of carnivore delight. TIm, Julie, and Chip all had a primi of ravioli – Julie with tomato sauce and Chip and Tim with butter and sage. Then the trolley. Good, good, good. This was just a warm up for the food day that followed. On Thursday at 12:30 we met for apperitivi at the Busatti’s house before lunch. It was such a wonderful day we had our drinks out on their front porch with a commanding view over Anghiari. We enjoyed a nice visit with Giovanni, Paola, their son Stefano, and Paola’s 96 year old father, Dr. Plini. It was a gorgeous day in a gorgeous home with wonderful people. we soldiered on. We had an incredible feast of salami, cheese, crostini, pasta, meat, and wine – red and white. We were stuffed like little piggies. We toured the Busatti factory, which is always a fascinating thing to do. Seeing how these incredible textiles are made make you want them even more. and it was absolutely divine. But before that, we had cheese, crostini, and salami. Then after the lasagna (yes, there was more food to come) we had grilled sausage and chicken. And roasted vegetables. And salad. And dessert. Baba – a rum-soaked cake – and cannoli. And grappa and vin santo. We were beyond full and our stomachs were stretched to their limits. We waddled home and fell into our respective beds in a very roly-poly way and dreamt the dreams that come with having spent a wonderful day with friends and food. So today, Tim, Julie, and Chip headed to Rome. Steve and I did nothing but take it easy and start to settle into our Italian way of life. A long walk, a few encounters with friends, a light lunch of fruit and cheese on our balcony, a nap, a gelato, a drink on the piazza, and a happy hour on our balcony watching the sky put on a kaleidoscope of a show. The best start to a vacation ever. 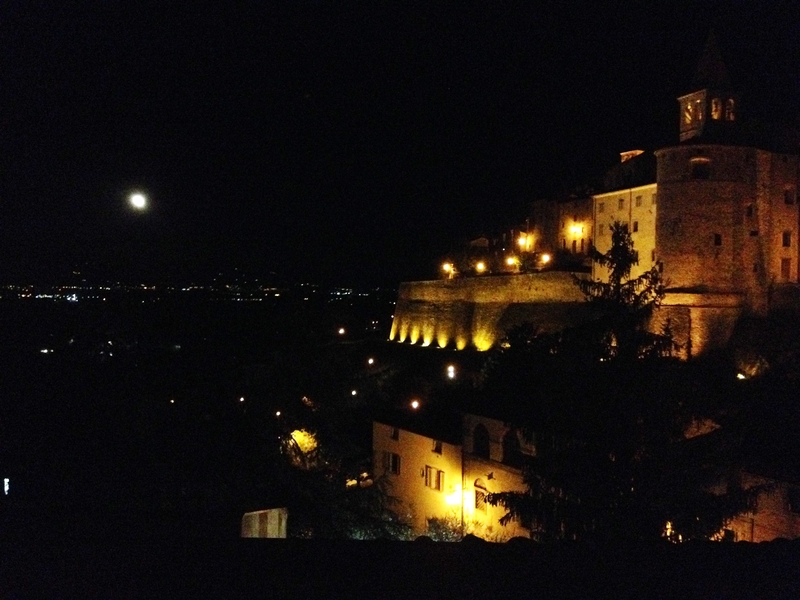 And then, as we were driving back from dinner, we saw the most gorgeous waning moon hanging low in the sky over the Tiber Valley. A fitting end to a perfect day. OMG! 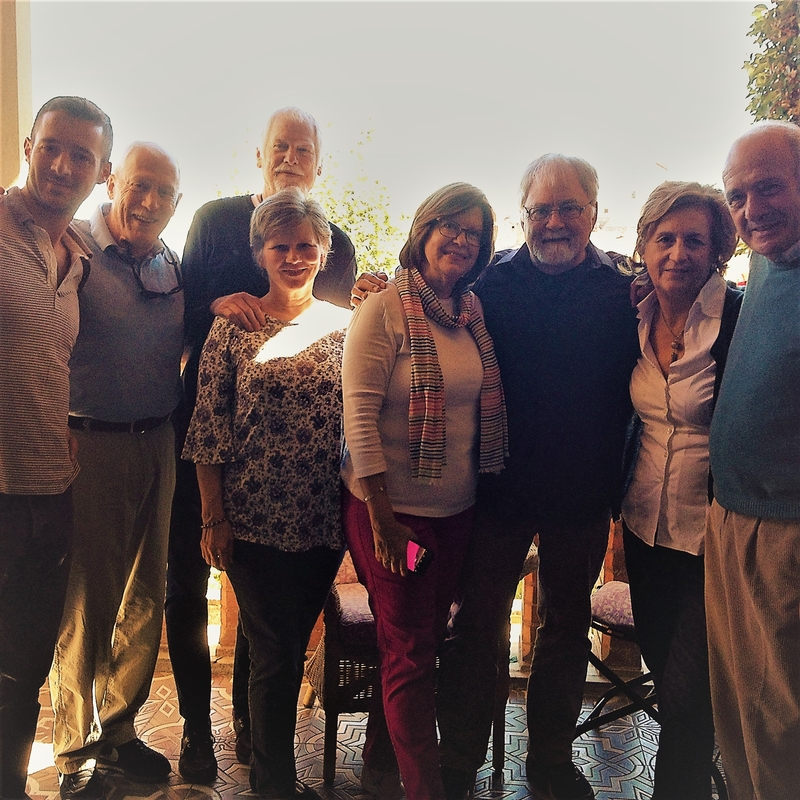 What a great recounting of our wondrous time in Anghiari, with such special friends. I don’t think I’ve ever eaten that much in one day! Well, maybe. But only in Italy and only with you! Sounds divine! I’d like meat trolley! What a great recap of a fabulous visit. The recap is nearly as much fun as the experience. Thanks! Cathy, how in the world did you capture that so well? We weren’t even in Anghiari for a full 48 hours, but we experienced enough Italian hospitality and food for an eon! Thank you and Steve for powering through your jet lag to host us so generously and ferry Chip, Tim and me from one fabulous meal and visit with Italian friends to the next. Bravo! We love you and Italia! !